Helvetica doesn’t need to feel lonely any more. The Museum of Modern Art in New York has acquired 23 typefaces for its collection. The New York Times has some decent coverage. Jason Kottke asked Jonathan Hoefler about the process of acquiring the typefaces. MetaFilter has a thread on what their designers look like. Congratulations to the typefaces—and their designers—for this prestigious honor. A “quiet launch” is definitely quiet when we completely miss any mention of it the first time around. Just prior to wowing us with his extensions to Founders Grotesk last week, the mighty Kris Sowersby managed to add some tasty italics to Tiempos Headline as well. Who knew? Brazil’s PintassilgoPrints is likely better known for their playful, hand-drawn faces. Their latest creation is Sforzando, a chunky pile of all-caps, display faces. Three heavy weights. Tons of alternates. It’s the typographic equivalent of a double rainbow. Aramara Chromatic is a stout, yet lively serif, specific designed to be creativity layered and drenched in color. Springsteel Serif is Jan Schmoeger’s companion to its sans serif cousin, Springsteel. Sporting the same contoured strokes as the sans, Springsteel Serif is a pleasant—if not slightly unusual—take on the slab text family. Subtle calligraphic forms. Informal, personable charm. Three basic weights. This describes Pollen, Eduardo Berliner’s new typeface for Type Together. Roman, italic, and bold. What more could you possibly need? Hannes von Döhren’s Supria Sans is not just another retake of your standard issue grotesque. This impressive superfamily covers two widths, six weight variations, and three styles—including an arguably mundane oblique and an intriguingly curvaceous italic. You can spot hints of Futura as well as several flavours of grotesque peeking out from behind the wide-ish geometry of Fontfabric’s Gabriel Sans. Six weights, plus italics. Smashing eBook #6 is all about web typography, and seems to be a steal at $9.90. Explore webfont pairings on FontFuse, from WebINK. Tim Brown discusses CSS properties that affect type rendering. In this lively Typophile thread on web licensing, Ray Larabie talks about the challenges of free fonts. Mike Parker takes us to Flanders in the latest installment of his Story of Type . At the Type Directors Club on April 15, Alexander Tochilovsky discusses the work of Herb Lubalin. Check out some lovely hand-painted signs from the Nutmegger Workshop. Speaking of quality craftsmanship, you should see what happens at House Industries. Three Questions interviews nine typographers. Are you allowed to digitize an old font and sell it by its old font name? Fast Company takes a look at Jonathan Safran Foer’s so-called unmakeable book, which feels almost straight out of the Oulipo group. Monotype is looking for a creative director. That’s it for this week—or so we think! Please let us know what we overlooked in the comments. Thanks to Grant Hutchinson for his coverage of another monster week of new type. I forgot to mention that today is John Baskerville’s birthday. He’d be a spry 305 years old. I don’t understand this ‘quiet launch’ thing. Kris draws really superb italics. he or Village should be shouting about them. I agree with you John. If I hadn’t trundled back through my Twitter foundries list looking for additional tidbits this past week, I wouldn’t have found anything regarding the release as all. From the rooftops, y’all! 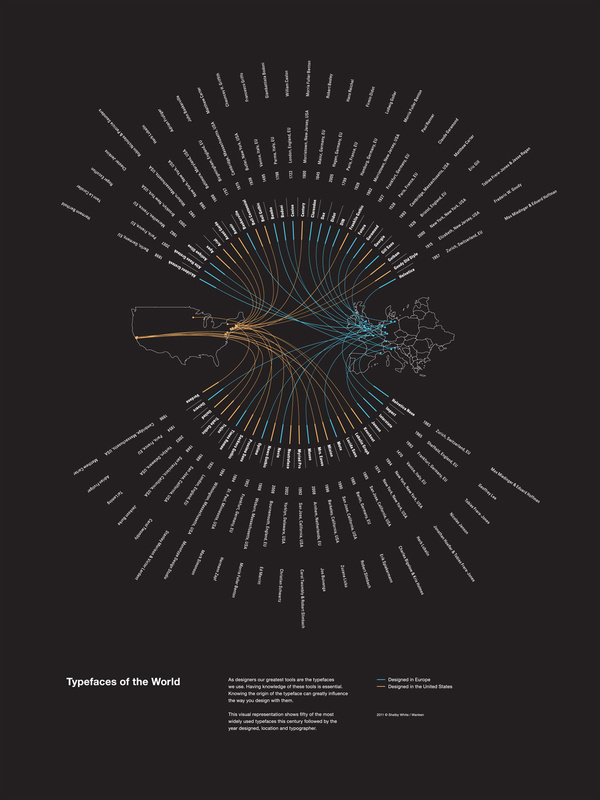 Shelby White has provided a link for a larger version of Typefaces of the World. You forgot to mention that you can get the Regular and Regular Italic of Supria Sans for FREE from MyFonts through the end of February. Good one, Paul. Thanks for the reminder. That’s a lovely pair of faces to be able to nab for nothing. Thanks Paul – I missed that!